BASSETERRE, St. Kitts, March 14, 2018 (Press Unit in the Office of the Prime Minister) – Citizens and residents continue to use the town hall meetings, organized by the Government of St. Kitts and Nevis, to express their satisfaction with the outstanding performance of the Team Unity Administration at the helm of the country in just three years in office. At Tuesday (March 13) night’s meeting held at the St. Johnston Community Centre in La Guerite, several members of the audience rose to their feet to applaud the efforts of the Dr. the Honourable Timothy Harris-led Government in areas of job creation, tourism development and improved economic performance. Managing Director of Timothy Beach Resort, Mr. Richard Boon, was one such person who commended the outstanding leadership of Prime Minister Harris and his Cabinet colleagues on the positive direction in which the country is heading. “Prime Minister, it’s a pleasure to experience your inspiration. I would like to say that the people that I hang with feel that you are a great leader. The economy is robust; you have invited integrity to your table and I am very optimistic for the future, so you are doing a great job,” Mr. Boon stated. 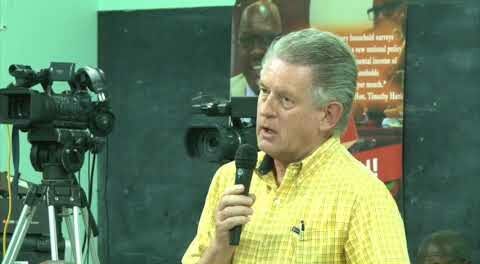 Mr. Boon’s remarks at Tuesday’s town hall meeting fall in line with similar sentiments expressed by residents at the Sandy Point town hall meeting held last week, where the Team Unity Administration was strongly commended for its efforts to improve the lives of Kittitians and Nevisians at home and abroad. This speaks volumes of the significance of the town hall series, which forms part of the government’s good governance and accountability agenda, where the leaders present themselves to the people and give detailed accounts of their stewardship.